*We are well underway in the second half of the 2018-19 La Liga season. After this weekend's games, Barcelona have been able to maintain their lead over Atlético, but Real Madrid has gotten a bit closer to their bitter rival, since their win against Sevilla has left Los Blancos as the owners of the third spot in the Spanish top flight. On the other side of the standings, legendary clubs Celta Vigo, Villarreal and Rayo Vallecano seem to be involved in a battle until the very end to keep their spot in the top football league in Spain. Only three points separate these clubs, and their current form helps us hint that the fight to avoid relegation will be extended until Matchday 38. Luis Suárez has kept his goalscoring form in two different leagues. The Uruguayan ace has reached an impressive feat for the seventh season in a row, thanks to his controversial strike against Leganés. Sergio Ramos is now the second active player with the most La Liga outings. The Spaniard has played over 400 games for Real Madrid, but his tally goes far beyond that number. Luka Modric also broke a personal record when he sent the ball to the back of the net against Sevilla on Saturday's clash. Being such an important player for Los Blancos, it seems rather strange to see the footballer struggle to see him reach a rather "easy" accomplishment, considering his quality. Marc-André Ter Stegen managed to earn a piece of history for himself. The goalkeeper is now the most capped international goalkeeper in Barcelona's history, surpassing Ruud Hesp's game tally. Furthermore, Ter Stegen has also entered the Spanish top flight's record books. Records & stats for Barca against Levante !! 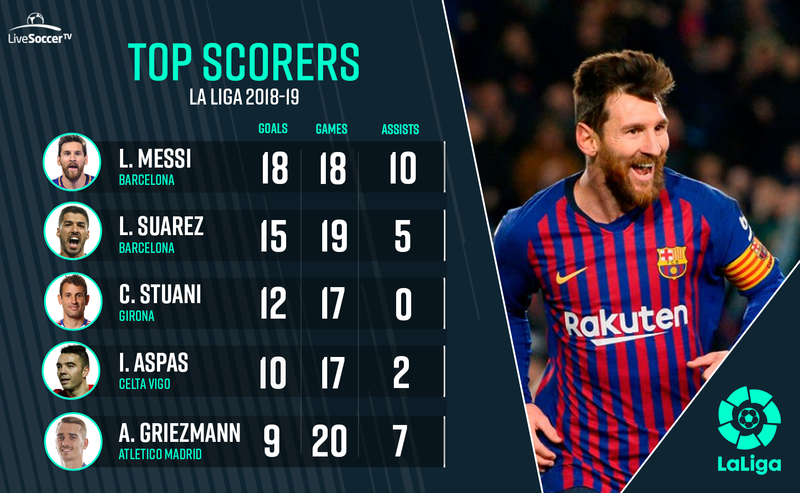 Messi and Suárez keep extending their lead as the best strikers in the Spanish top flight. Something tells us that no one will be able to catch up with Barcelona's goalscoring duo.